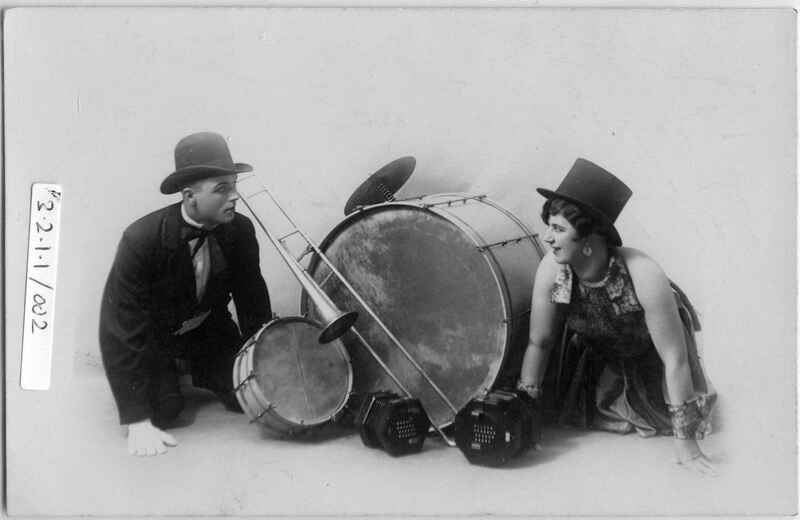 Full Description: A Dutch postcard of the “Empiro Duo”, the man in DJ & Bow Tie & Bowler hat-, the woman in showy dress & top hat, and the duo posing on their knees with a double bass, snare drum and a black Lachenal New Model, a 48-key treble English, and a 48-Key Wheatstone Aeola, probably a Baritone. The rear is signed in pencil “Souvenir de Empiro Duo, Hof straat, Merxcem-Anvers”. Also stamped “Photographie Jos. Bulens, Merxcem, Bredabaan, Chausee de Breda, 568/1”.